Originally featured on Authority Magazine via Medium. I had the pleasure of interviewing AJ Abdallat, CEO and co-founder of Beyond Limits, a pioneering AI company with a unique legacy from the US space program. As CEO of Beyond Limits, he’s building what he believes is the “most disruptive technology since electricity and the internet”: Artificial Intelligence. AI typically involves a system or machine performing functions a casual observer would view as intelligent. Mr. Abdallat is a serial entrepreneur with decades years of experience building technology startups in AI, cognitive reasoning, and smart sensors. He founded Beyond Limits in 2014 to bring technologies from Caltech and NASA’s Jet Propulsion Lab that have been proven in space missions and transform them into advanced AI solutions to solve challenging problems for companies on Earth. Starting in 1998, Dr. Carl Kukkonen and I started working with Caltech, which manages the Jet Propulsion Laboratory for NASA. With the support of Caltech president, Dr. David Baltimore, we set on a course to commercialize technologies developed at NASA’s Jet Propulsion Laboratory for the space program, including smart sensors and artificial intelligence projects. That was the beginning. I’ve founded several companies to bring NASA/JPL space innovations to market, the latest of which is Beyond Limits. We are an artificial intelligence company with unique IP and unparalleled technology portfolio. This is software that’s been tested and proven in the most challenging conditions imaginable. And we are blessed to be in a position to adapt this brilliant technology for commercial use. But we take it beyond that, inventing new cognitive reasoning systems to help companies on Earth to transform their businesses and industrial operations. One example was the development of a technology called the tunable diode laser that was developed to accurately detect water vapor on the surface of Mars. Mars has a very harsh and unforgiving environment, so the technology had to be very robust. One laser went to Mars, and we created a company with the other one to apply the technology to the energy industry, because moisture is a big contaminant for natural gas pipelines. The company became very successful and a leader in its field. A lot of things set us apart. Firstly, we focus on solving big problems for large scale industries that matter. That touch millions of people. We’re not interested in serving up pizza ads on your phone or beating the Jeopardy champion. Maybe it’s our origins in the space program, but we tend to pioneer in solving complex problems in high risk environments where the mission can’t fail. Exploring space is about being able to handle the unknown. Real-world, industrial-grade AI needs to do the same to handle business issues at scale, across different industries — that’s exactly what we’re doing at Beyond Limits. Beyond Limits’ cognitive intelligence has strong roots in bio-inspired algorithms, which emulate the functions of the human brain. Our systems are trained using observed data. But unlike most of the competition, our systems are also educated by facts, situational awareness, and human knowledge. It allows us to do things like deductive, inductive and abductive reasoning. Really the ability to do human like reasoning. This means we can solve problems that neural nets cannot, especially when the data is sparse or unreliable. Our systems utilize human knowledge to learn context and meaning so they can make good recommendations to people for faster, better, decision-making, with reduced risk. AI will be one of the most disruptive and productive advances in computer science the world has seen. It is poised to have a transformative effect on consumer, enterprise, industrial, and government markets around the world. While there are certainly obstacles to overcome, consumers believe that AI has the potential to assist in medical breakthroughs, improving health and safety, democratize costly services, elevate poor customer service, and even free up an overburdened workforce. Some tech optimists believe AI could create a world where human abilities are amplified as machines help mankind process, analyze, and evaluate the abundance of data that creates today’s world, allowing humans to spend more time engaged in high-level thinking, creativity, and decision-making — one day it may even become our friends and companions. Most enterprises deploying AI solutions today have focused their efforts on improving existing business or industrial processes. Not undertaking more ambitious, and risky, “moonshots.” But these focused one-off AI applications are only the first steps to utilizing AI to its full potential. Conventional AI systems are what we refer to as black box implementations, where systems are trained based on data, but cannot explain how they got the answer. That bothers me. At Beyond Limits, we’re taking a different approach where we can explain how we got the answer. Our systems provide an audit trail that explains the rationale and evidence for the answer. NASA will not implement any system where you cannot explain how you got the answer and provide an audit trail. We’ve built our capabilities and technologies from the ground up to deliver explainability and provide the audit trail. That has proved very effective in the sectors we operate in. I think establishing trust is important. In industries where the stakes are high, like medicine, energy, finance, people need accurate information. We need to have the doctors, engineers, and other professionals understand how they got the answer and provide them with that audit trail. Think of it this way. Imagine I need to have an operation. I want the surgeon to have access to 20 smart AI agents. AI can advise the surgeon, providing information about my medical history and my reaction to drugs, for example. If you give me the option: do you want one surgeon, or one plus 20 intelligent agents? I would take the one plus 20. One of the big highlights for me is that we’ve proved that our cognitive approach works for very tough and demanding industrial applications. Our unique approach to AI unifies both Numeric approaches (machine learning & deep learning) with Symbolic logic to create cognitive reasoning capability to handle complex industrial problems where actionable intelligence is required. I am proud to say with this approach, we have been able to demonstrate cognitive intelligence and win many opportunities including top 10 global companies. In one opportunity, we were the fourth AI company to be engaged. But where the others — famous names in technology — hadn’t panned out, we won the business and proved that our methods work. What we said we could do, we did. We won the opportunity, but more than that, the ultimate compliment was when our customer decided to become our strategic investor. If we keep doing what we’re already doing, we’ll see widespread adoption around the world. The best performing companies of tomorrow are embracing digitalization today. The question is no longer whether AI will fundamentally change the workplace. It’s happening. I think you’re going to see 2019 as the year for embedded intelligence. Software will continue to be king in AI. But you’re also going to see hardware playing a significant role, especially intelligence at the extreme edge. With cognitive intelligence and situational awareness embedded at the edge, typically implanted in chips, this introduces the ability to read sensor data and analyze it in the context of historical data, human expertise, and overall system performance goals in order to solve problems on the spot, in real time. This has profound positive implications for delivering the benefits of AI-driven robotic solutions to industries as diverse as healthcare clinical patient care and industrial process control in remote or dangerous locations. It could bring human expertise to every node in a network, no matter how geographically dispersed. For autonomous operations to succeed on earth, as they have in space, the next big milestone in AI is intelligent hardware. We will be the first company to deploy symbolic AI on a chip. Coming soon to a device near you. We are highly cognizant of the overpromise and clichés surrounding AI in the popular imagination and media. In contrast, our approach is to be ultra-practical, plain-spoken, and honest about the role of intelligent systems powered by cognitive AI. What we have to share is our point of view, our experience, and our intellectual capital. One of the misconceptions about AI, about conventional AI, is that some people feel machines are going to be taking our jobs. In reality, we are automating repetitive or dangerous tasks. Gartner did a report in 2017 where they forecasted that by 2020 artificial intelligence will automate about 1.8 million jobs. But they also forecasted that by 2020 AI is going to create 2.3 million jobs. So, the net gain is projected to be about 500,000 jobs. Cognitive AI is not about chatbots, talking virtual assistants, or playing chess against a machine. It’s about powering the next generation of intelligent commercial and industrial edge devices, making it possible to apply them in scenarios that we can only dream about right now, for large scale industries that matter to millions of people. So we try to paint the picture of AI helping people, working side-by-side with human beings to solve problems faster, better, and with more insight than ever before possible. This is our message and our belief. I have been fortunate that throughout my career I worked for many smart people and learned a lot from them. I always worked very hard and had the support of my colleagues and managers. It is hard to pick a single individual when there are so many but as an entrepreneur two individuals had an impact on my career. My first partner Dr. Carl Kukkonen former head of the Center for Space Microelectronics Technology at the NASA Jet Propulsion Laboratory (JPL) and Dr. David Baltimore, former president of Caltech, who helped create a commercialization echo system around Caltech that allowed me and Dr. Kukkonen to successfully commercialize technologies out of JPL. Currently, Beyond Limits focuses on specific vertical markets. We’re partnering with a giant energy company to help them manage production in mature subsurface reservoirs. We’re delivering cognitive abilities so they can predict where to drill next, safely, and efficiently. That’s going to make energy less expensive and help everyone. We’re working with healthcare providers to accurately diagnose patient conditions with a high degree of confidence. Eventually that will save lives and produce more efficient systems. We’re working with major financial institutions on applying cognitive reasoning to fintech. And in automotive to keep drivers healthy and safe. Through it all, we’re adhering to our strong values around transparency in AI reasoning. We’re helping to build a new technology hub in the LA region. And because we value the talent of our people, we strongly practice diversity and inclusion in our hiring. Being an entrepreneur is hard! Make your own mistakes. Don’t let others make them for you. Nothing is worse than making a decision that you don’t believe in to appease others. Work with market dynamics. Pick your battles and don’t waste energy on fighting the market. Take time to enjoy the journey. Enjoy the journey and have a more balanced business and personal life. Fail fast, fail small, learn, and move on. In the realm of artificial intelligence, I’d like to drive a movement that inspires Explainable AI with an Audit Trail. As we move into this era of collaboration between humans and machines, it is very important that we establish trust and credibility. Humans need to trust that the results provided by machines are verifiable. Humans need to be trusted that they provided the right unbiased data behind the results. At Beyond Limits we believe that explainability and verifiability are paramount to the responsible use of AI. An AI that can explain itself improves executive decision-making and accountability. Although a machine may be making a suggestion, humans make final decisions and are accountable for the consequences. For executives to take responsibility for a machine’s decisions, they must understand the risks involved and be confident that the AI is making the right decisions for the right reasons. Above all, explainable, cognitive AI builds trust with people so humans and machines can work together in a collaborative, symbiotic way. If AI is ever to live up to its promises to transform facets of business and society, human users must be able to trust machine-generated decisions. For that to happen, AI must be able to “show its work” and provide a human-comprehensible explanation for its decisions. Trust your gut instincts. Don’t compromise on your values. I would say it goes back to do what you believe in. Don’t let others influence you. I pay attention to what I describe as a gut feeling. It doesn’t mean that I’m so good at predicting things, but I think after 20 years you start developing a great BS detector. I think for an entrepreneur this is important. There was one time where I trusted my instincts over experience and it worked out well. We had started discussions with a major energy company, and the price of oil at the time was at $28. I remember talking to a VC about the company, and he didn’t understand why we would go after oil and gas business when the price of oil was so low. But I had a good feeling about it and believed in it. I felt if we can turn the situation around, great things can happen. I’m not going to tell you I predicted they would also invest in the company, because I really had no clue. But I trusted my feeling that they would be a good customer. Indeed, this customer became an outstanding strategic partner for us. Beyond Limits is full stack AI engineering company with unique technology from the NASA space program developed at Caltech’s Jet Propulsion Laboratory (JPL). We take advanced software systems developed for NASA/JPL, harden them to industrial strength, and deploy them in solutions that go beyond conventional AI. For our customers it means we have a huge head start on R&D, with solutions proven under the most demanding circumstances imaginable. Our approach is a hybrid, blending numeric deep learning and machine learning tools together with symbolic AIs that emulate human intuition, or cognitive intelligence. 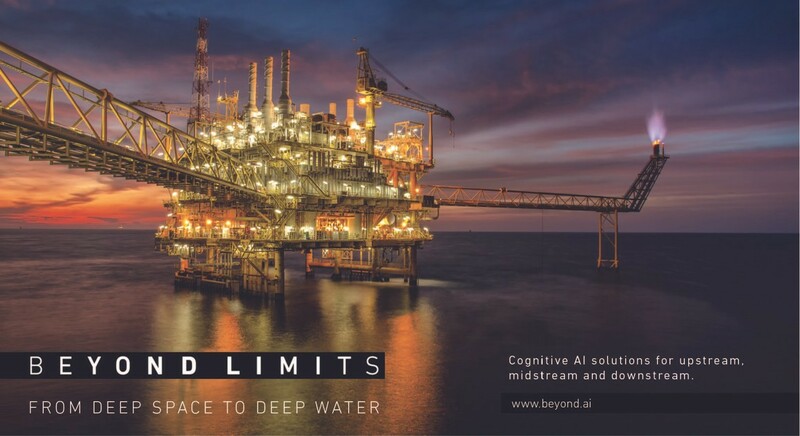 Beyond Limits’ cognitive agents are trained and deployed to solve complex industrial and enterprise problems to help energy, fin-tech, healthcare, and logistics companies stay competitive and transform their business for the future. On the horizon in the next five years is having AI systems talk to each other. We think that connected intelligence — having cognitive agents talk to each other — is going to be the wave of the future. Possibly the “holy grail in AI”. Hive mind systems globally capture domain knowledge and disseminate it across all sectors, cross pollinating prior experiences to solve problems. Employing a data-driven network effect, hive mind intelligence amplifies the knowledge, wisdom, and intuitions of human populations, creating “Artificial Experts” that can answer questions, make predictions, and generate insights that are far more accurate than the individuals could produce on their own. Beyond Limits will be a pioneer in developing what we call The Cognitive Corporation.